Mark is a dedicated family advocate whose practice encompasses all aspects of family law. His easy approach, robust advocacy and user friendly demeanour make him a popular choice with solicitors. Mark regularly represents local authorities, parents and guardians in public law proceedings across all tiers of Court. Such cases involve non accidental injury including ‘baby shaking’ cases, infant death, sexual and physical abuse as well as neglect cases. In private law cases, Mark represents parents in relation to residence applications, including shared residence, contact and specific issue. 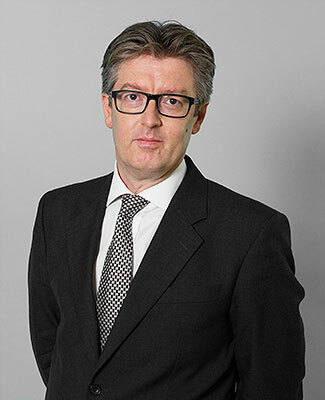 Mark regularly appears in the High Court representing parents in cases of Child Abduction, (both Hague and non Hague cases), Inherent Jurisdiction, Wardship, Brussels II and International Relocation of Children. Within the breakdown of marriage, Mark represents husbands and wives in ancillary relief cases, including “big money” cases, financial provision for children and CSA appeals. Increasingly Mark is instructed in cases where the court’s jurisdiction is questioned and the issue of “Forum Conveniens” has to be determined. Additionally Mark has appeared in the Care Standards Tribunal in an appeal against the incorporation of a social worker on the POCA list. Mark’s interests include sailing, skiing and squash. A cross-jurisdictional specialist who represents notable individuals in private children disputes. He mainly acts in cases concerning relocation, abduction and enforcement orders, among other international issues. He has experience of dealing with Hague and non-Hague jurisdictions. Recent work: Intervened on behalf of a legal charity into a Supreme Court appeal. The issue in question was anticipatory breach in retention cases. A cross-jurisdictional specialist who represents notable individuals in private children disputes. He mainly acts in cases concerning relocation, abduction and enforcement orders among other international issues. He has experience of dealing with Hague and non-Hague jurisdictions. Recent work: Represented a mother estranged from her child for four years following its removal to Egypt after a family holiday. A cross-jurisdictional specialist who represents notable individuals in private children disputes. He mainly acts in cases concerning relocation, abduction and enforcement orders. An experienced practitioner who deals with cross-border children issues. These include child abduction and relocation matters. An experienced advocate in both private and public law proceedings, whose practice has a particular focus on cases relating to the international movement of children. He regularly handles leave to remove matters in both Hague and non-Hague jurisdictions. A new entrant in the rankings this year, who is noted for his handling of high-profile cases concerning abduction and the international movement of children. Recent work: Recently appealed in the Court of Appeal in Re: J, a Hague abduction case.